Thanksgiving Day was a huge success. My daughter, Katie, was such a big help (she peeled 14 lbs. of potatoes by herself), that I told her Friday was her day; I'd do whatever she wanted . Her eyes lit up and she squealed, "Shopping. Tomorrow. Let's do it!" And so we did. Not at 4AM mind you. We left at a much more sensible 7AM and the dear girl even treated me to a Starbucks! Tomorrow, it's back to a normal schedule and hopefully normal eating habits. 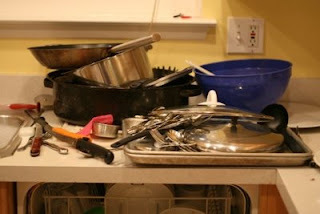 I'm hosting Thanksgiving dinner for 20; so, I"ll be off the computer and in the kitchen today and tomorrow. The Homeschool Blog Awards have announced the winners. Congratulations to them all. Finally, if you're looking to get a jump start on your Christmas shopping this weekend, you can get an awesome gift for the homeschoolers on your list without battling the crowds at the mall or breaking the bank. The Old Schoolhouse Magazine is having a sale on subscriptions during their annual Black Friday Sale. From November 26 -30 you can get a one-year subscription for the low price of $7.95. You can get all the details and learn about their other offers here. Happy Thanksgiving, I'll be back in a few days. I enjoy reading many different blogs, especially well-written blogs of those that view life from a completely different perspective than I do. I learn much about them and even more about myself; however, finding common ground is rare. In fact, their opinions usually stir up a mini-debate in my own mind about how I might respond but rarely do I comment. So imagine my surprise when I read Christine Escobar's article at the Huffington Post about liberals and home education and found a bit of common ground. Escobar is a left-leaning homeschooling mom, who was prompted by the "demented" comments of Joy Behar to remind her fellow liberals that being open-minded is supposed to one of their trademarks. "I think it's healthy for people to see the flip side once in a while. It seems the problem with some folks who consider themselves open-minded, liberal and left-leaning, is that they think you aren't for the people unless you are 100% behind public schooling. That's utter nonsense. Left-leaning people support the right for men and women to choose marriage, whether they are gay or straight. I support that too. They often support the idea that women's bodies are theirs only and that the government must not make laws dictating their choice to have or not have children. I support that too. So, what's wrong with having the freedom to choose your child's best educational environment? The spectacle of pro-choice liberals opposing homeschooling has to rank as one of the seven great wonders of the political world. Escobar's advice about seeing the flip-side might also come in handy now that the holidays are upon us. Parents in a California elementary school are in a feud over Thanksgiving costumes that some find offensive. Both sides seem pretty determined not to give in to the presssure of the other. And in a nod to political correctness, Florida Gulf Coast University is now limiting holiday decorations. They have renamed their giving tree a giving garden and traded their greeting card contest for an ugly sweater contest. So how long before someone is offended by the term "ugly" and they change it to an "aesthetically challenged" sweater contest? Prompted by the the announcement of a Homeschool Leadership Summit and the attempt to define a homeschool standard, homeschool blogger Melina, would like to find common ground between secular and Christian homeschoolers. Our world has plenty of divisions. It is easy to find things to judge in other people. Places where we disagree, fundamentally offend, and just plain don't like. The hard part is finding common ground, which could also be called sacred ground. Until we expand our common ground, the fantasy of a peaceful human race will be impossibly out of reach. In the case of homeschoolers like me, and male-led-family homeschoolers, the common ground is very tiny but very clear: we both believe in our right to make our own family culture. The right to organize our family in the way that best supports its members, free from judgment or coercion from outside forces. So while I vehemently disagree with the premise of Bible-endorsed male-led family structure, I am just as adamant in the right for a family to make that choice. I encourage all homeschoolers, religious and secular, to embrace a culture of non-judgment. Isn't that a value we can all agree on? The problem with asking if a culture of "non-judgment" is something we can all agree on, is that those that say "no", are likely to be judged by those who think that this is a value we can all agree on! But I'll take the risk and say, "no" I don't think a culture of non-judgment is something we can all agree on. Simply because judgments are made by each of us every day and those judgments will affect others. Choosing one curriculum over another is a judgment that affects both vendors. If I tell others why I chose one over the other this multiplies the effect and has the potential to offend. On my blog, my choice of topics and voicing my thoughts about them could cause others to feel judged by what I've said. It's happened before and will likely happen again. Should I stop blogging on a topic simply because others may feel judged? Should I cease taking a strong stand on a issue because others might become offended? Making a judgment of right or wrong should not be banned from public discourse. Rather, it is how I respond when confronted by those judgments that is more important and within my control. I cannot prevent others from judging me for my choices nor can I prevent them from feeling judged by what I say or do. But I can refuse to become offended by their judgment and hopefully deal with them and the disagreement maturely. So, rather than asking for a culture of "non-judgment" and attitude of non-offense when disagreements or judgments occur would be a much better choice for me. In these tough economic times it's nice to find a few items where the price is right. If you're not familiar with Trivium Pursuit and the Bluedorn family, you're missing out on some of the best resources available for homeschoolers. I'm using their book, The Fallacy Detective and The Thinking Toolbox, as a supplements in my informal logic class for middle schoolers with great success. Until the end of the month, they are making two of their e-books available for free. You can get all the details here. While you're at it, if you're looking for excellent picture books for young readers check out Johanna Bluedorns books as well. Need a unique recipe to add sparkle to your Thanksgiving feast? New punch recipe? Crunchy salad? Fabulous dessert? Homeschool mom of six, Cheryl Moeller's cookbook, Aunt Sarah's Alaskan Cookbook, will give your guests cause for a standing ovation. You can receive a free copy from now until Thanksgiving Day. For your free cookbook, click here. I appreciate the encouraging notes that are sent to me from time to time from readers of my blog. The note usually includes a sentence that says something like, "I don't know how you have time to blog." We all have our addictions; mine is blogging and Starbucks. The bad economy has forced me to severely cut back on my Starbucks, but thankfully blogging is still FREE! There are a few free resources that I use to make my blogging easier. Bloglines enables me to read a lot of information quickly and categorize it for later retrieval. You can also subscribe to your favorite blogs by email and have their most recent posts sent to your inbox. (You can subscribe to SpunkyHomeschool by putting your email in the box located at the top of the sidebar on the right.) Utilizing these services have maximized my time on the internet and allowed me to blog efficiently. Concerned about the number of overweight people in Oklahoma, a Democrat lawmaker wants every student, sixteen years and younger, to be weighed, measured, and their BMI calculated - including homeschool kids. However, if parents don't work with school and health officials, the matter could be turned over to the state Department of Human Services for possible investigation, he said. Unless a parent complies they can be "investigated." So much for probable cause and innocent until proven guilty. I've heard the illogical rationale for this type of legislation before. It usually goes something like this: If a parent has nothing to hide why would they object to their child being weighed? Mr. Morrisette calls this a "nutrition bill." "It is a nutrition bill with a near-zero fiscal impact that has the potential to improve every aspect of life in Oklahoma, as children need to learn at an early age the importance of eating healthy." Mr. Morrisette needs learn the importance of the Constitution and the Fourth Amendment. Something he obviously failed to learn at an early age. In a discussion about Obama and the education of their two daughters, Joy Behar of The View slams homeschoolers and calls all lot of them "demented when they're homeschooled" and that "they learn to be scared of other children." The discussion begins at the 5:45 min. mark. Behar's remarks are at the 7:08 min. mark. Considering the comments come from Behar, I think "demented" might actually be a compliment. Hat tip to Extraordinariliy Ordinary for spotlight this and reminding me once again why I don't watch TV. I think our discussion here about the Obamas and the education of their daughters was much better. I've decided to become a Democrat. Seriously, my kids too. They've even begun marching around the house dressed in military fatigues muttering "because of Obama" and volunteering to do the dishes, fold the laundry, and take out the trash. Miraculous, I know. When I saw the change in them, I wished I'd converted to the Democrat Party even sooner. But better late than never I suppose. What caused this drastic change of heart? Well, it all started with a phone call from my daughter early one frosty morning. The car had broken down. She was in a panic and needed a bailout. Momma can you come get me! Next in the line up was my son. He just had tooth extracted and braces put on. The site where the tooth was pulled became infected. He was in serious pain and needed a bailout. Momma can you get me some medicine! Then there was my five-year old who woke up early in the morning with the stomach flu. She was looking pretty green and in desperate need of a bailout. Momma can you get me a bowl! Suddenly, a light shown through the window and I had an epiphany. It wasn't momma I needed but Obama! After all, if he can bailout the Big Three why not Spunky! It was time to spread the mess around. Mine eyes have seen the glory of the coming The One. He has trampled on conservatives who never have any fun. He will cure my sick child and make my auto run. His change is marching on. Karen Campbell sent along this video about a forthcoming homeschool documentary, The Rock From Which We Were Hewn. The documentary seeks to inform the viewer about the history of homeschooling with the purpose of motivating homeschoolers to consider what may be be ahead for the homeschool movement. The video production is professional but the build-up of suspense using music and courtrooms attempts to provoke a sense of urgency and fear that I'm not sure is warranted. The sentence "This movement has continued, its history undefined." also seems a bit confusing. History is written as people live their lives and make decisions. We should know the history of homeschooling, but I'm not sure how to "define" it. My first introduction to homeschooling in 1981 until today, I viewed homeschooling more as a verb than a noun. I would say to my friends and family, "We are homeschooling." Not, "We have joined the homeschool movement." I understand and accept that homeschooling has become a movement, but I never considered myself part of a particular movement toward a particular end, even though I am a Christian that homeschools. In fact, I usually resisted the "bandwagon" mindset that was prominent among many homeschoolers, especially in the early days when a certain curriculum was "God's choice" for the homeschool family and those that didn't adopt the curriculum were shunned. Secular and Christian homeschoolers are both part of homeschooling in America and its history. Each has made significant contributions to the liberties we now enjoy. I certainly hope that those that seek to tell the history allow all the facts to be known. We'll see. Karen also sent along a link to a Homeschool Leadership Summit taking place in March, 2009. "The home education movement has reached a critical juncture . . . With the explosion of school choices and increased government intrusion in homeschooling, the time has come to define a vision, and in the words of George Washington, "Let us raise a standard to which the wise and the honest can repair; the event is in the hand of God." Otherwise, we will see the heart of what we have worked for fade away. In March of 2009, Christian Home Educators of Colorado will host homeschool leaders from around the country at a national gathering in Indianapolis. The Purpose? To lay out a vision for home education in the 21st Century." I do not want to see the freedom to homeschool fade away, but I'm not certain that a self-appointed group of homeschool leaders raising a standard for the "homeschool movement" is the answer. As Christians homeschoolers, we have one standard: God's word. Secular homeschoolers have whatever standard they choose to adopt or none at all. The best way to make sure that homeschool freedoms don't fade away is to educate parents on what has happened and the possible ramifications of certain choices, especially those involving the state. But I do not see the need for a separate standard or to define a vision for home education for the 21st Century. One area I have a great deal of empathy for President-elect Obama and his wife, Michelle is with their two daughters, Sasha and Malia. Parenting isn't an easy task for anyone, but the job is made infinitely more difficult when everyone wants to know everything about you. What school will the girls attend and what puppy will take up residence with them in the White House seem to be the two topics most chatted about recently, but in the 24/7 age of the internet will it end there? Children residing in the White House is not unique, Chelsea Clinton and Amy Carter were also young girls when their dad entered the White House. But John Podhertz explains why maintaining the Obama girls privacy is likely to be more difficult this time around. "Malia and Sasha Obama are part of the new world of childhood, a vastly more public world, with scores of television shows directed toward their age group, consumer goods specifically targeted at them, and the celebrity journalism sector completely without shame in exploiting performing children to keep itself in business. The question may not be what the adult Obamas will want, but what the junior Obamas will want. What if they decide, over the coming years, that they hunger for the company of Hannah Montana, that they would be thrilled to be on the cover of People? More disturbing, perhaps: What if their school classmates decide to post cellphone videos of them on YouTube? What if rumors about their conduct hit shameless, willing-to-say-or-publish-anything sites like Gawker? One heard things, almost certainly invented, about the Clintons and their relationship with Chelsea from Washington people who claimed to know the truth because their kids went to school with Chelsea. But that was before the Internet really exploded. Protecting Sasha and Malia from the mainstream media will be easy for the Obamas, because the mainstream media will go along. Protecting them from the world beyond it will be harder. And protecting them from the desires they may themselves feel when they know they can have or be anything they wish to be might be the hardest job of all." For the girls, sake I hope that people leave them alone. But if not, I suppose the Obamas can always homeschool! It seems with the election of Barack Obama everyone is feeling pretty patriotic these days, doesn't it? Only be forewarned, some people within the new Obama administration may not define patriotism the way you or I might. It isn't certain that Barack Obama will implement the plan exactly as Emmanuel outlines here, but the fact that he chose him as his chief-of-staff is not an encouraging sign. Emmanuel's co-author Bruce Reed says this isn't a draft. Then just how will "every" young people "know" that the nation will "enlist" them for three month of basic training without a draft? How patriotic does this make you feel? As a reminder, here's the speech Obama gave calling for the a civilian national security force that is just as powerful and well funded as the United States military. Taking a break from current events for a moment, here's some blog related news. Voting has begun for the 2008 Homeschool Blog Awards. There are plenty of great blogs nominated in a variety of categories, so here's your chance to vote for your favorites and become acquainted with some new blogs you may not know about. 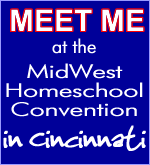 In other blog news, I have been invited to live-blog the Midwest Homeschool Convention April 16-18, 2009 in Cincinnati, Ohio. I'll also present a workshop on blogging and homeschooling on behalf of The Old Schoolhouse Magazine. This is a great event with an excellent roster of speakers. I'm humbled to be a part of this fun and informative event. If you can carve out some time in April, I'd love to meet you in Cinci. Finally, I was invited by my daughter's Journalism Ethics professor to present a guest lecture on blogging and its impact on the culture and media. Her request came when she heard that I had competed against (and nearly beat) Penn State Professor of American literature and cultural studies, Micheal Berube for the 2006 Wizbang Blog Awards. The lecture is tomorrow at 10AM. If nothing else, I'm looking forward to giving one more lecture to my daughter! Many homeschoolers are wondering how the election of Barack Obama will affect education and homeschooling. That remains to be seen - literally - because Barack Obama has taken his whole agenda down from his website, Change.gov. A few vague paragraphs remain, but most of the pertinent information on the issues was removed this weekend. I realized this today when I attempted to finish a post on Obama's plan to require community service; I started the post last Friday after a brief exchange in the comments section. At that time, I copied this portion from the Change.gov website. "The Obama Administration will call on Americans to serve in order to meet the nation’s challenges. President-Elect Obama will expand national service programs like AmeriCorps and Peace Corps and will create a new Classroom Corps to help teachers in underserved schools, as well as a new Health Corps, Clean Energy Corps, and Veterans Corps. Obama will call on citizens of all ages to serve America, by developing a plan to require 50 hours of community service in middle school and high school and 100 hours of community service in college every year. Obama will encourage retiring Americans to serve by improving programs available for individuals over age 55, while at the same time promoting youth programs such as Youth Build and Head Start." When I grabbed the text, I forgot to copy the URL. When I went back to the website today to grab the link, I noticed the page wasn't there. In fact, nothing that I previously read regarding the Obama agenda was on the website. (There was a section at the bottom that linked to a variety of issues.) What happened? The Obama Administration will call on Americans to serve in order to meet the nation’s challenges. President-Elect Obama will expand national service programs like AmeriCorps and Peace Corps and will create a new Classroom Corps to help teachers in underserved schools, as well as a new Health Corps, Clean Energy Corps, and Veterans Corps. Obama will call on citizens of all ages to serve America, by setting a goal that all middle school and high school students do 50 hours of community service a year and by developing a plan so that all college students who conduct 100 hours of community service receive a universal and fully refundable tax credit ensuring that the first $4,000 of their college education is completely free. Obama will encourage retiring Americans to serve by improving programs available for individuals over age 55, while at the same time promoting youth programs such as Youth Build and Head Start. Most of the information was just repeated from his campaign website, so why take it down? Now that he's been elected, perhaps Team Obama is worried that people might actually read the fine print and find out just how "progressive" he really is. But requiring citizens to work without compensation is not progressive, it's regressive. Those are changes Barack Obama obviously doesn't want you and I to see. Is it any wonder that Obama selected the URL "change.gov" for his new website? Obama promised to fundamentally change government. Perhaps he's hoping we won't remember exactly what those changes were now that he's President-elect. Thankfully, there are too many people paying attention. Over the weekend an Obama spokesman, Valerie Jarrett, told Tom Brokaw, "given the daunting challenges that we face, it's important that president elect Obama is prepared to really take power and begin to rule day one." Before day one, can somebody please remind Team Obama that he's in America where "we the people" rule and the President serves with our consent. They might also want to mention to him slavery was outlawed and no one works without just compensation, including our children. Change.gov is a catchy URL, but let's not carry this change mantra too far. After all, there are a were a few moments in our nation's history when we did do things right. Change.gov: The new slavery and Change.gov: Infringements on Liberty. I especially liked this thought, "The Obama transition team deliberately appeals to the American ideal of freedom while undermining it at the same time." Fayetteville teacher Diatha Harris talks about a controversial online video that shows her telling a student her soldier father might stay in Iraq another 100 years because of her support for presidential candidate John McCain. The teacher regrets saying "So, that means that your father could stay in Iraq for 100 years." She has apologized to the student and her parents for saying it. She also believes she is not browbeating the students and is troubled by the editting that was done. Watch the video interview at WRAL.com. "But the parents of that student, and the student herself, said Friday that teacher Diantha Harris did nothing wrong. "Filmmaker Folke Ryden said during a telephone interview from his home in Sweden that Harris was “exaggerating” with her comments to students that day to get them interested in a discussion about the presidential race. He had asked her to talk about politics in the classroom for his film. He said the comment about the child's father staying in the military for 100 years was a joke. I'll have to go watch the video again, I must have missed the laughter from the kids the first time. I guess this whole controversy is just the fault of conservative bloggers who just don't know how to take a joke! So what are we to think about the teacher saying "Oh, Jesus" every time a student mentions John McCain? The Fayetteville Oberver adds more details here. The daughter of a military soldier is nearly in tears as her elementary school teacher berates her for saying she is for John McCain. The teacher scoffs and tells the young girl, "So that means that your daddy could stay in the military for another hundred years! So much for tolerance and respect for diversity in the public schools. I can only imagine what would have happened if this had been a white teacher berating a black student for supporting Barack Obama because he failed to protect infants born-alive after a botched abortion. Unable to snag a press conference with Barack Obama for over a month, anxious reporters desperate for news consoled themselves with a brief Q & A with Obama's antagonist-in-chief Spunky from SpunkyHomeschool. Question: Spunky, now that the election is over will you be able to get over your bitterness and anger and support President-elect Barack Obama? Answer: Spunky respects the decision reached by some people to elect Barack Obama as the next president of the United States, provided Barack Obama conforms to the laws and principles set forward by the Constitution governing these United States of America. Somebody forgot to tell these guys that Obama's a man of hope and change, not fear and intimidation. On a lighter less intimidating note, I was at the grocery store with my five year old and someone noticed she had on an "I voted" sticker. They asked her who she voted for? She said, "I'll let you know after the election, if McCain wins, I'm for McCain. If Obama wins, I'm for Obama." Then she looked up at me and said "Is that how it works mom?" Not wanting to dampen her idealist notions I repled, "Yeah, that's how it works. Sort of." And please don't get too worked up about the outcome. After all, we're Americans. We don't worry, we eat. To quote a Krispy Kreme ad, "Celebrating one of America’s most coveted constitutional rights can be oh-so-sweet." Krispy Kreme is giving away a free donut to everyone who has the "I voted." sticker. Starbucks is giving away something today too, "If you care enough to vote, we care enough to give you a free cup of coffee." You don't even need the sticker, they're trusting you to be honest. The voluntary redistribution of wealth continues over at Ben & Jerry's. 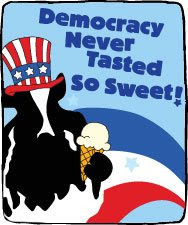 If you vote, they'll give you a free ice cream cone from 5-8PM. It's truly amazing that all of this generosity occured without Congress passing one law or taking the first bite out of my donut. Obviously, Americans are not as selfish as some would like us to believe. Go vote and enjoy enjoy the day! Update: Oops! It looks like Starbuck's promotion might be illegal. "No good deed goes unpunished," said Nick Handy, director of elections.Handy said there is a federal statute that prohibits any reward for voting. Starbucks' good deed can be perceived as paying someone to vote, and that’s illegal, Handy said. "The way it is written, it expressly prohibits giving any kind of gift,"
Astounding, election officials are all over Starbucks, but don't dare investigate all the illegal contributions to the Obama campaign through the internet. Obama can't even take care of his own family, yet we're supposed to believe he'll keep his promise to take care of us? It's been a long election cycle, so I thought it might be helpful to post this video from the Weekly Standard to document all of the different and contradictory statements Obama has said in his quest to become the next president of the United States. Obama loves rich people and he loves their money too. So much that he wants to take it and give it to other people to spend. He thinks that's charity, I call it stealing. As Davey Crockett rightly said, "It's not yours to give." Go ahead and redistribute as many of your peanut butter and jelly sandwiches as you would like, but don't take mine and give it away while you keep yours and then turn around and call me selfish. Now I was family, I reminded myself; now I had responsibilities. Nice prose for a memoir, but it's just words that provided millions for Obama but nothing for Aunt Zeituni. Ironically, Aunt Zeituni has found it within her heart to dig deep into her pocket to help her nephew. She has donated money to the Obama campaign. "Federal Election Commission records show that Onyango donated at least five times to her nephew's campaign in July and September. Three of the donations were for $5 each, and two of the donations were for $25. Records compiled by The Huffington Post show she gave a total of $260 to the campaign." Michelle Malkin reports that Aunt Zeituni is living in Boston illegally and as such, she is ineligible to to donate to a political campaign. So Aunti Zeituni lives in the United States illegally, living on welfare in subsidized housing, and illegally contributes to the campaign of Barack Obama, while he stumps around the country telling us we're selfish? Obama, said, "Selfishness is not a virtue" true enough. But selfishness isn't a crime either. If it were Obama would be in prison for the way he treats his own Aunt Zeituni and other family members. And this is the politics of hope and change? Michelle Obama was right in 2004 when she said that Obama wasn't ready to be president because he hasn't done anything yet - not even for dear Aunt Zeituni. UPDATE: The Obama campaign is giving Aunt Zeituni back her contributions to the campaign. Vote for Obama and the treats are gonna flow. If you help him, he's gonna help you. Your gas tank will always full and you won't have to pay your mortgage. No one, not even Obama, can meet the expectations he has set. Sadly, the fact that they've actually been tricked won't be obvious until after the election and they wake up with an empty gas tank. .
"the single most important factor in determining a child's achievement is not the color of their skin or where they come from; it's not who their parents are or how much money they have. It's who their teacher is." Since definitions matter, I thought I'd repost my definition of a teacher. "There's something cheesy about a 30-minute commercial. One half expects Obama to be introduced by a pitchman in a loud sweater: "But wait, there's more! If you act by Nov. 4, you also get the foreign policy expertise of Sen. Joe Biden!" Exactly. What can Obama possibly say tonight that he hasn't already said in the last two years? That he was wrong about Iraq? That Bill Ayres was best man in his wedding? That he really wasn't born in the United States and this was all a bad dream? That if he's elected Joe the Plumber will be in charge of all the leaks in the White House? But obviously we're not going to get any of that. We're going to get flags flown high, families in crisis desperate for a bailout, and Obama empathetically looking into the camera to tell us that he knows exactly how we all feel and that help is on the way. Ironically, the blessings of America and voluntary contributions have allowed Obama to buy the air time. But isn't there something oddly unAmerican about having someone other than the President appear during prime-time on all the major networks in an address to the nation? He's paid for the right to be there, but he hasn't earned the right to be there. And that's why to me and the LA Times this whole thing seems manufactured. Update: The Associated Press' didn't think Obama had his numbers quite right. "Democratic presidential candidate Barack Obama was less than upfront in his half-hour commercial Wednesday night about the costs of his programs and the crushing pressures he would face in office." "Now, I don't believe that government can or should try to solve all our problems. I know you don't either. But I do believe that government should do that which we cannot do for ourselves - protect us from harm and provide a decent education for our children;...."(emphasis added)"
If America's parents accept Obama's premise that we cannot provide a decent education ourselves and therefore the government should provide it, we are left to the beliefs and legislative whims of those in authority to define a "decent education" for "our" children. That isn't a good thing for us, our children, or our freedom. As parents charged with the responsibility of educating our children, our definition will become subordinate to their definition and will likely require some proof of compliance. Failure to conform to the standard of a "decent education" dictated by the state would likely result in lack of consideration for college or employment opportunities or worse, charges of educational neglect simply because our definition does not match theirs. I readily acknowledge that this would not happen right away so some might be quick to dismiss this as a scare tactic against Obama. It's not. The rule of debate is - he who defines wins. I am NOT willing to yield the definition of a "decent" to the state- no matter who is in the White House. Are you? Don't misunderstand. The desire for a "decent education" for all is noble and laudable. But an equal education is a fallacy because as individuals we will never all have the same definition or goal. What one may call a success or a "decent education" another would call a complete failure. That is the great dilemma of the public schools. Equal education only works with a uniform goal. A goal which works well for the state but leaves the individual out in the cold. In that last couple of days, I've had a few phone calls from homeschool moms stressed out for various reasons and in desperate need of a bit of encouragement. Why they called me I'll never figure out! Talk about stressed out. Homeschooling while trying to keep up with all the news this election season has been no picnic for me. (grin) Does recalculating the results of the electoral map count as both geography and math for the day? I didn't think so. Oh well, if you're in need a a little encouragement or a distraction from the election, you might want to check out the Carnival of Homeschooling hosted by the Cate's at Why Homeschool. If you need to get out of the house and away from the computer to really break the stress cycle, head on over to Barnes and Noble for a complimentary cappacino. Hurry, the offer ends Friday. And while your at the bookstore, pick up the Fall issue of The Old Schoolhouse Magazine. In this issue, I talked with Dr. Callahan about his college-prep high school video math program that covers Algebra 1, Geometry, PreCalculus, and Calculus. But if you're not quite at that point in your homeschool, there's plenty of other encouraging articles to keep you going. Thanks, but no thanks, Senator Obama. We don't need your help to solve the problem of providing a decent education for "our" children. As hard as it is for you to believe, over a million homeschool families are doing just fine without your help. Sherry at Semicolon has an excellent list of Obama "in his own words." We are a home schooling family in Texas. I read your blog regularly and glean so much from you. I wanted to know your opinion on a matter. I am worried about the future of home schooling especially if Obama wins and the Democrats are in charge. I never finished college and am now wondering if I should go back and get my degree and get a teacher's certification. Do you think that home school moms will have to be certified to teach in the near future? This is something that has been on my mind these past few weeks. Thank you for your time and again I really appreciate your blog and all your insight. Teacher certification or any added restrictions on homeschooling depends more on your own state legislature or state supreme court ruling than who is elected the next president. However, as long as there is a federal department of education there is always the possibility that something could be passed nationally - no matter who is elected. Republicans and Democrats are both eager to "fix" our schools. Quality teachers for a"all" children is always part of that fix. Clinton had School-to-Work and Outcome Based Education (OBE) and Bush had No Child Left Behind (NCLB), both of which could have negatively impacted homeschoolers. Thankfullly, OBE was defeated and homeschoolers were exempted from the requirements of NCLB, so I wouldn't panic and drop homeschooling and enroll in a teachers college just yet. But at the same time don't become complacent in the (unlikely) event McCain/Palin gains the White House. Something that might affect homeschoolers in a future administration would the passage of national testing and standards. In the past, homeschoolers have successfully fought and won exemption from such requirements, but with every new administration comes new uncertainties. Who the next president appoints as the the Secretary for the Department of Education will tell us quite a bit about their priorties and the adminstration's education agenda. The Council of the Great City Schools released an open letter to the next president calling for such standards to raise expectations for students in every state. "I don't believe we can have a federal accountability system without some kind of national standards," said Houston Independent School District Superintendent Abelardo Saavedra. Whoever the next president is, credentialing and national standards are both issues to watch in the coming years. Since Barack Obama's website has said nothing in regards to homeschooling, I called the Obama campaign four times this week asking if Obama supports homeschooling. None of the volunteers I spoke with seemed to know because Obama has never said anything about homeschooling. However, Obama spokesman, Justin Hamilton, recently answered the question posed by Suburban Journals. "Q. Do you support home schooling? A. Barack Obama respects the decisions reached by some parents to home school their children, provided those parents are conforming to the laws and regulations set forward by their states governing home-based instruction." I respect Obama too, but that doesn't mean I support him. This statement is absolutely meaningless. For more information on Obama's education plan, check out Maggie's very informative post about his chief education advisor Linda Darling-Hammond. Via Gateway Pundit: In a 1995 interview, Barack Obama is critical of white executives" living out in the suburbs who do not want to pay taxes to inner city children for them to go to school" The video demonstrates that his past ideology is still reflected in his current rhetoric. So if a white suburban executive rejects higher taxes for the purpose of government mandated wealth redistribution, he is a racist? I don't think so. I simply reject socialism. It is my job, not the governments, to help my neighbor - black or white. "my individual salvation is not going to come about without a collective salvation for the country. Unfotunately, I think that recognition requires that we make sacrifices and this country is not always willing to make the sacrifices to bring about a new day and a new age." Linking one's personal salvation to a "collective salvation" may seem like an odd comment until you understand Black Liberation Theology. Watch this interview with Black Liberation Theology founder, James Cone as he explains how religion is never completely separated from power. It's worth watching the whole 20 minutes, but in a nutshell "If you are part of the dominant group in this society you are being violent." According to Cone, Clarence Thomas is considered "white" because he has become part of the powerful and not identified with the vicitms in America. Interviewer: (Quoting from Cone's book) "Most whites want mercy and forigiveness, but not justice and reparations." How does the cross inform the issue of justice and reparations. Cone: Well, the cross as I said, is God taking the side of the victim. It is a symbol of that. God making ultimate identification with the powerless. Now, if the powerful in our society, the white people, if they want to become Christians they have to give up that power and become identified with the powerless; if you're gonna to be a Christian. You can't be identified with the powerful and also a Christian at the same time, that's a contradiction of terms. Now, how do I know if you're really identified with the vicitim? Well, if you're identified with the vicitm you not only want to feel good about that, you also have to pay back that which you took. You don't just say please forigive me now. The only way in which your repentance, your forgiveness, can be can be authentic, your reception of it can be authrentic, your repentance can be authentic is that you give back what you took. And white people took a lot from black people. It becomes easier to understand why Barack Obama, a black man, would seek wealth redistribution as a part of his agenda as President. If he doesn't, like Thomas the ninth "white" justice on the Supreme Court, he's at risk of becoming just another "white" man in the White House.